May I ask where you buy your pillow covers? 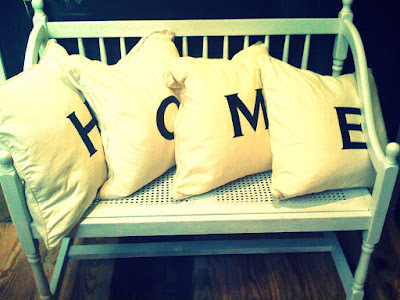 LOVE these pillows...and the bench is awesome too! Love it..the whole vigniette is awesome!! no way! I have that same bench torn apart and primed in my garage right now!!! It was a garage sale find from last weekend. did it used to have 2 (ugly) built in cushions where you have the peg board? I was stuck on what to do with the 'holes' after I destroyed the cushions! thanks! Funny I noticed we follow alot of the same people. Great minds think alike. will you be selling any of these in your store? I really want a B and a 7 pillow. I love HOME! So many words and phrases are so overdone, I'm tired of them and I don't even have any in my own home. Love this!